It is an Android problem: bluetooth does not function in a satisfactory manner. Having recently started to “hack” into Android devices, and learning while doing, I was immediately confronted with the real world of something that does not fully work (bluetooth in Android devices) at least not satisfactorily as with J2ME devices I worked with before (Nokia and Blackberry). It is worse if you do, as I did, in buying an Android smartphone in China (A3 Star, HTC T8585 clone) . You will be immediately confronted with the merchants that are insensitive to your requests for technical support. Effectively you learn immediately that there is nobody out there to talk to. When I connected my Android phone to external devices, in my case a bluetooth module, the immediate response was an “unable to connect” toast. “Googling“ made me desperate when the enormity of information confused me even more. How to approach the problem, what is wrong with my cheap chinese Android phone? MediaTek the chipset manufacturer of the device’s processor does not “leak” out any source codes to be able to hack bluetooth libraries for example. If you seek quality technical responses I advise you Stack Overflow. That is where I finally learnt a few things such as the problem of connection is overcome with Reflection method. Technically-speaking the reason is that the widely used connection method CreateInsecureRfcommSocketToServiceRecord() was only included starting with Android API Level 10. When targeting an API lower than 10 (ex 2.3.3 or Gingerbread), the method is not publicly accessible. The Reflection method overcomes that. So in my chinese HTC clone “A3 Star” I have now a fully working Android market’s BlueTerm, a free app that I use for my engineering tests with external devices. I had to hack into BlueTerm´s source code (it is publicly available at http://pymasde.es/blueterm/) in order to change the method of connection to the Reflection one. Looking into libraries of my phone’s processor MTK6573, I noted that they were made in 2008, and were never updated. Perhaps in China (the primary target of MTK processors) they do not use SPP at all, and are insensible to “techie“ learners like me wanting to use SPP connection in bluetooth. You are now ready to compile and download the BlueTerm app into your Andorid device, hopefully without any errors. 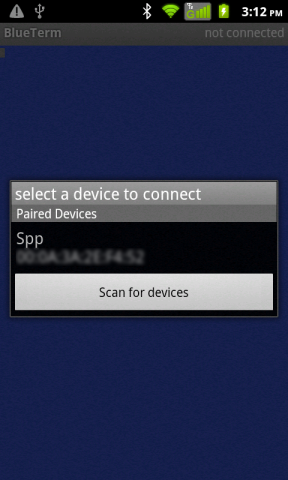 Choose the device and immediately BlueTerm will show the message at the top right of the screen “connecting…”. UPDATE: For non-techincal users of Android devices I have made available a ready to install BlueTerm app at my most recent post. Before downloading the apk, please read my disclaimer on the same page. This mod is quite fresh and needs to be tested further. I have had to reboot once my HTC clone as the app froze when I tried to disconnect. Any improvements and code sharing from visitors to this blog will be appreciated. If you want a fully working smartphone do not buy in China, and if you really want to take the risk, check beforehand on the reliability of your supplier. However I confess, I have an inside feeling of gratitude to the chinese, because if everything was working fine, I would have had no challenges to overcome, and would have not learnt much about Android bluetooth. The chinese manufacturers do not make available source codes, while non-chinese manufacturers do, or have “leaked” source codes. Source codes mean opportunities to mod and to improve and a chinese manufacturers do not seem to “leak” these codes. 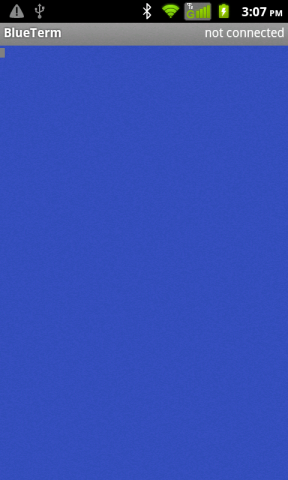 Just as Bluescripts does the next step for me will be to connect in default way, and then in alternate way (update: I have already made a ready to install modded app of Blueterm – check above). From now on, I will be able to write new apps for my chinese HTC clone, using Reflection method. The Reflection method is only valid for situations similar to mine. I hope that sharing this work of mine will help others with similar error messages “unable to connect” in their Android devices. This entry was posted in Mobile Apps, Programming and tagged Android, Bluetooth "blues", Bluetooth issues, Java, MediaTek, Reflection method. Bookmark the permalink. You are completely right. Indeed I learnt something due to the challenge in making it work. I download the source code for BlueScripts and I can’t find the file named BluetoothSerialService.java. Can you send me the source code for Blueterm_RM.apk? Welcome to blog. You have to read the article. I show how to do itt. You also need source code of Blueterm’s original code. If you know how to compile in Eclipse you will know how to do it. Yes you are right it is stackoverflow. I will edit the post and write correctly. It seems the bluetooh issue is still prevalent in some Android phones. Welcome to my blog. You will need to check into code and modify it. At the moment thee code only allows sending commands not to receive any data. So you will not be able to use with a scanner. but what about not connected issue sir ?? device is not connecting with it . It is one way communication. Your Android device should connect to the scanner. Not the other way round. I am trying to connect my android device to RN42 module.The bluetooth connection works almost perfectly when my device is Samsung S2, but when I try it using iball 3G 7271(a chinese device) I see that my connection to the RN42 is very inconsistent.It throws exceptions like- Service Discovery failed,connection is not created(failed or aborted) to name a few.Whereas I never have seen this errors while running the same code on S2. 03-13 09:51:39.730: I/BluetoothSocket_MTK(10598): [JSR82] readLock got. 03-13 09:51:41.260: W/System.err(10598): java.io.IOException: [JSR82] connect: Connection is not created (failed or aborted). 1) What is the difference between Bluetooth_MDK and Bluetooth.cpp? 2) What is SSP and SDP? 3) Will my using the reflection method ensure that my connection is always successful in the latter device. I am searching a soln for this for almost a week but in vain,Pl reply/mail me as I need to deliver this project soon.Thanks ! Welcome to my bog. I can state that you need to learn a bit more to learn about SPP. I have shown a method. If you pinpoint the problems I can perhaps help but without knowing what you are doing and emulating them I cannot say really what is happening. I have 4.0.4 (API 15) on my tablet but I still need reflection to create RFCOMM socket. Welcome to my blog. What do you want to do? It would be great, if you know that why this reflection trick is still needed. Wish you removed all of the comments. Ops, forgot to remove tags.